This process is cyclical and starts again in 2018 as illustrated in the figure. In order to achieve its goal, the MSFD has established European marine regions and sub-regions on the basis of geographical and environmental criteria. Ecosystem health is determined by a wide variety of topics and in different stages in the DPSIR framework (Drivers, Pressures, State, Impact, Response). The MSFD aims to assess, and if necessary, improve the status using 11 descriptors. Determining these descriptors requires a large variety of data and information. 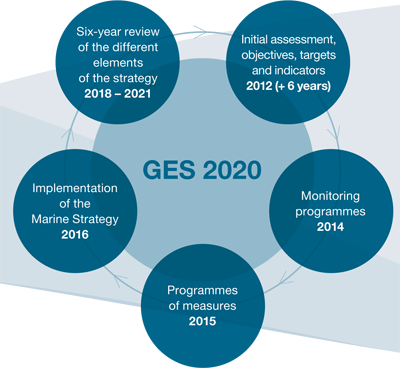 The Marine Strategy Framework Directive (MSFD) requires that data and information relating to Member State's initial assessments (Art 8) and monitoring programmes (Art 9) are made available to the Commission and the EEA (Art 19.3). Data and information concerns ecosystem components, anthropogenic pressures and impacts on the marine environment. Marine environmental data and information (physical, chemical and biological) is one part of this. For that purpose there is a lot of activity ongoing between EU, EEA, Regional Sea Conventions and Member States for formulating and developing mechanisms and methodologies for compiling, processing, managing and giving access to relevant data and information as part of the MSFD implementation. The European Marine Observation and Data Network (EMODnet) is a long term marine data initiative from EC DG MARE underpinning its Marine Knowledge 2020 strategy. EMODnet is a consortium of organisations assembling European marine data, data products and metadata from diverse sources in a uniform way. EMODnet is underway since 2009 and currently provides access to an increasing base of European marine data across seven discipline-based themes: bathymetry, geology, physics, chemistry, biology, seabed habitats and human activities. For each of these themes, EMODnet has created a gateway to a range of data archives managed by local, national, regional and international organisations. Data providers originate from government, science and industry sectors. They work together to provide users more and better access to standardized observations, data quality indicators and derived data products for the European sea regions. Therefore EMODnet can be a complementary source and support infrastructure for contributing to fulfilling the data and information needs of the MSFD implementation. In particular EMODnet Chemistry considers the stakeholders in the MSFD implementation as its major customers and is directing its developments towards serving this community. It has a focus on chemicals in the water column, sediment and biota and aims to provide high quality marine environmental data and related products on the scale of regions and sub-regions of the MSFD which can contribute to the MSFD implementation. In particular this concerns potential contributions for determining MSFD Descriptors 5 (eutrophication), 8 (chemical pollution), 9 (contaminants in seafood), and 10 (marine litter) considering the MSFD Common Implementation Strategy. Implementing this strategy requires good understanding of the MSFD requirements as well as cooperation and tuning with major MSFD stakeholders such as EU DG Environment, EEA, Regional Sea Conventions, and Member States.